Alaskas Kenai Peninsula is a popular travel destination--and for good reason. In many ways, this part of Alaska is a microcosm of all thats wonderful about the Last Frontier. From seas teeming with life to sky-high mountains with abundant wildlife and sprawling icefields, the Kenai Peninsula quite simply is Alaskas hot spot. The Kenai region is becoming a classic Alaska land destination as well as a favorite for cruise lines and their passengers, thanks to popular pre- and post-cruise programs now (some ships now call on Seward and Homer as Kenai adventure bases). Jutting out about 150 miles from south central Alaska just south of the states largest city, Anchorage, the Kenai Peninsula is almost completely surrounded by Prince William Sound and the Gulf of Alaska on the east, and Cook Inlet to the west. The sprawling peninsula extends about 150 miles southwest of the Chugach Mountains. Ranging up to 7,000 feet and more, the glacier-packed Kenai Mountains run down the eastern side of the area and much of the range is part of Kenai Fjords National Park. Many crystal-clear mountain and flatland lakes and salmon-laced rivers dot the landscape of the peninsulas pretty interior. There are also several ice fields with glacier offshoots in the eastern and southern areas of the peninsula, with Sargent Icefield and Harding Icefield among the most famous for good reason. These ice-blue glaciers are often first viewed by many visitors traveling between Seward and Anchorage on the Seward Highway--a National Scenic Byway--or aboard the fabled Alaska Railroad. The road and the train ends in Seward. Stunning Seward is literally just the tip of the iceberg when it comes to Kenai exploration near and far. It is named after William H. Seward, the U.S. Secretary of State who led the drive to purchase Alaska from Russia. The truly awe-inspiring Kenai Fjords National Park is one of many draws here, with the Harding Icefields many glaciers (Aialik Glacier is a favorite destination) and lots of wildlife spottings (like whales, seals, puffins, and more) among highlights typically enjoyed on a wide variety of nature day cruises out of Seward. Kayak tours focusing on nearby Resurrection Bays wildlife and scenery are also growing in popularity including visits out to remote Fox Island. Back in Seward proper and in the shadow of the almost 3,000-foot Mount Marathon, Seward features the must-see Alaska SeaLife Center. The worlds first cold water marine institute, the center features many underwater viewing tanks, lots of live displays, and several advanced interactive exhibits. Wildlife typically seen out in the Kenai Fjords is also found here, including sea lions, harbor seals, and varied birds. The behind-the-scenes tour is well worth the additional charge. Just outside town, Exit Glacier is the only part of Kenai Fjords National Park accessible by road. Other Seward highlights must include the Seward Museum, numerous seafood restaurants (try the fresh haddock, if its on the menu) and additional outdoor adventures like Seaveys Ididaride Sled Dog Tours for a taste of the famed Iditarod race. The city also offers free public transportation between the cruise terminal, the railroad depot, and several other destinations around town. Over on the southwestern tip, the town of Homer is similar to Seward--providing easy access to mild to wild outdoor adventures. Kachemak Bay State Park is a popular natural destination, as are several fishing and outdoor-oriented lodges. Homers famed Spit is a 4.5-mile spit of land that juts out into Kachemak Bay at the end of the Kenai Peninsula. Its home to only-in-Alaska restaurants, bars, and shops, as well as well as waterfront Seafarers Memorial and many fishing charter boats. Homer bills itself as the Halibut Fishing Capital of the World for good reason. South of Homer and reached by plane or ferry, Kodiak Island and the town of Kodiak is yet another southern Alaska draw (known for its Kodiak brown bears). Highlights here have to include: bear viewing trips by sea plane; world-class fishing; Kodiak National Wildlife Refuge Visitor Center; Ft. Abercrombie State Historical Park and the Military History Museum (great for World War II buffs); the Alutiiq Museum (native heritage); the Maritime Museum (Kodiaks museum without walls); the Baranov Museum; the Russian Orthodox Church and St. Hermans Theological Seminary; and the Alaska Fisheries Science Center (including a great aquarium and touch tank). 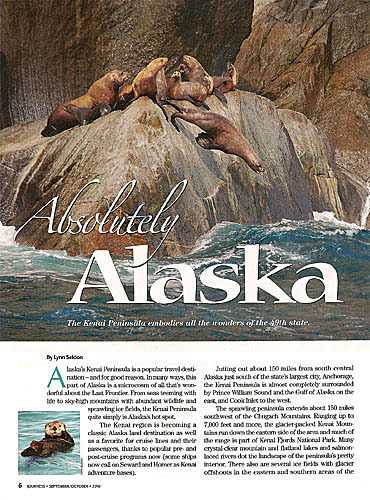 Additional possibilities around the peninsula have to include Kenai National Wildlife Refuge (home to 6,500-plus huge moose); Chugach National Forest (with lots of leaping salmon in-season at Cooper Landing); historic Russian-influenced Ninilchik; and Soldotna on the Kenai River (location of the world record King Salmon catch at 97 pounds). Near Anchorage, Girdwood and Alyeska Resort , home of the popular Alyeska Aerial Tram and tandem paragliding for first-timers, is a must-see. Visitors heading to the Kenai Peninsula often pass through Alaskas largest city, Anchorage. Some choose to stay for a few nights to explore Anchorages many downtown and nearby pleasures. Or, visitors on several cruises now can see Anchorage. Holland America is the first major cruise line to offer port calls to Anchorage during the popular new 14-day sailing out of Seattle. Sitting at the base of the Chugach Mountains and within sight of five other massive mountain ranges, this cosmopolitan city of about 283,000 (more than 40 percent of the states total population) has much to offer. A great place to start exploration is at the unique Visitor Information Center at Fourth Avenue and F Street. The Anchorage Museum completed its 80,000-square-foot expansion in May, with additions including the Thomas Planetarium, interactive science exhibits at the Imaginarium Discovery Center, and the Smithsonian Arctic Studies Center. The expansion reached beyond the museums new walls to a new two-acre outdoor common area filled with young birch trees opening into downtown Anchorage. Along with old favorites like Humpys Great Alaskan Alehouse and Oomingmak--The Qiviut Shop (Arctic gifts), the downtown area has a host of new restaurants, shops, and events. Located in the historic Fourth Avenue Marketplace, the newly-renovated Alaska Experience Theatre features 3-D films, Alaska native dancing, and the popular Alaska Salmon Bake Dinner Theatre (with dancing and film screenings about the Northern Lights, the 1964 earthquake, and other Alaska history and highlights). Other Anchorage possibilities can include: Alaska Native Heritage Center (focusing on the regions 11 major cultures); Alaska Museum of Natural History; famed and friendly 10th and M Seafoods (they ship); the nearby scenic Tony Knowles Coastal Trail (for biking and hiking); hiking up nearby Flattop Mountain; and easy access to an array of Alaska outdoor adventures (including frequent Alaska Railroad trains).